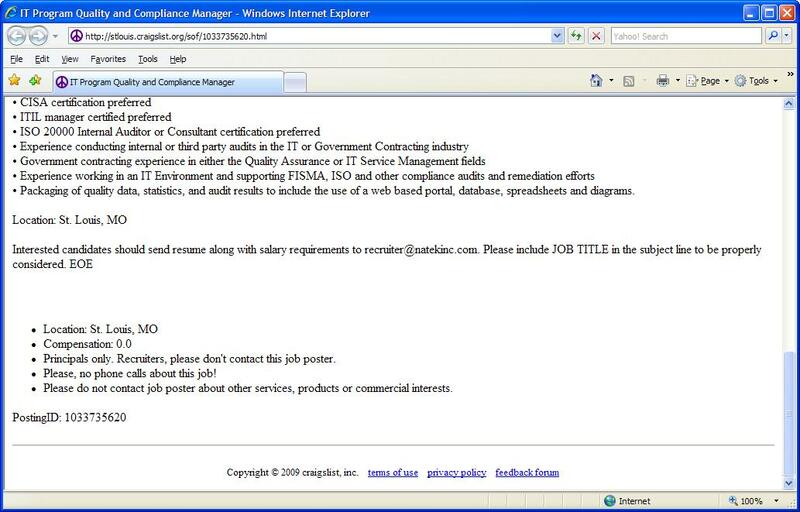 Now, I tried to recreate this, but I couldn’t, probably because I don’t have enough clearance to see the classified jobs listed. However, I did note a couple of things of note on Monster.com. If it’s February, it must be time to pick on MovieTickets.com again. In addition to not having fixed the error I mentioned last February, I encountered a couple of new ones today that kinda send a message, if you know what I mean. One of the fringe benefits for QA for an actual barbarian is that you get to keep what you kill. If only we did that in America, I’d own millions of dollars in software. 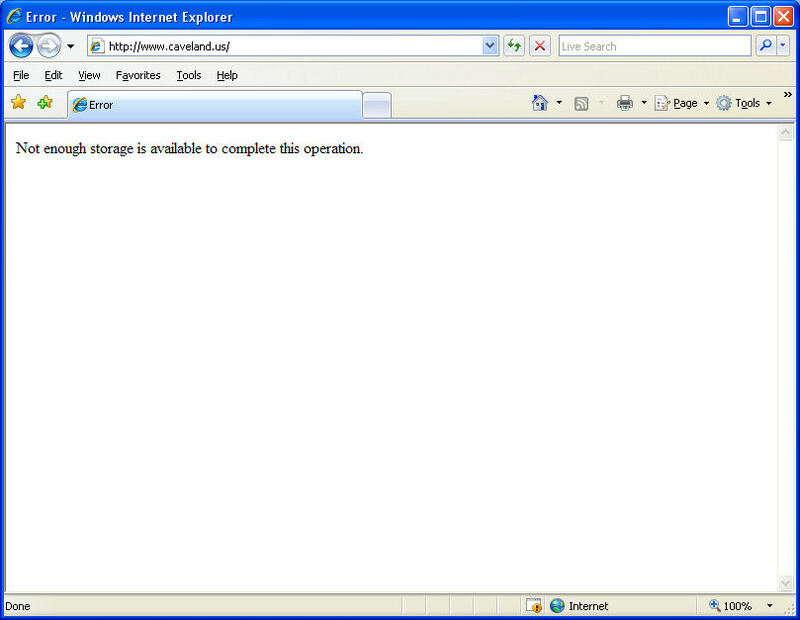 Fortunately, there’s nothing else in Web page design that would look like that. Me, I wanted to click on Accurate, but apparently that page doesn’t exist. Why did it catch my eye? Because I like stupid-funny films? No, because I had to mouse over it to get to the text in the Web site beneath it, and a panel rolled out that didn’t make sense. The Office of Inadequate Security. Can you learn something from it? Maybe. But you can sure feel glad that your organization isn’t on it. Yet. Bite the Shark: to demonstrate fierce and possibly foolish loyalty for someone or something. I’d bite the shark for this company! In my case, of course, it would be something like I’d bite a customer account manager for my team! Not so much out of loyalty, though. I like the taste. You know how I feel about re-upping for free magazines; not so much that they want to keep their lead list accurate, but that they make it so tedious for me to do so. You know what the solution to an options is null error is? Vodka. Lots of vodka. Sure, your options will still be null, but you won’t care. Many jobs on Craigslist cover the fact that they pay nothing relative to the professional scale by using terms like market or depends on experience. This company, on the other hand, comes right out and says it. If you’re interested, remember to put JOB TITLE in the subject line of your message. You Want Good, Improvisational Agile Training? Laughing. Overcoming embarrassment. Out-and-out goofy behavior. These are not normally the skills managers seek in their developers. But some agile development advocates believe these skills are critical for successful software projects. A growing number of artistically inclined corporate trainers are promoting the principles of the Agile Manifesto with techniques from acting, improvisation and other art forms. Such exercises attempt to prepare software developers for changing requirements and other unexpected occurrences throughout the agile development process. Developers learn better ways to work together and how to put the team before the individual. If you want to train them how it really works, you do the same thing I do to train new QA people: You cut the electricity, pull the fire alarm, and wait by the stairwell with an old American Gladiators padded quarterstaff you bought off of eBay. Anyone who makes it out of the building can survive the ever-changing timelines and predictable, avoidable, but always sudden “emergencies” that, well, emerge. Anyone who knocks me off my feet or separates me from the quarterstaff gets a field promotion to Senior Test Engineer. Or if you want to simply waste an afternoon, I guess you could hire these Agile training consultants for some entertainment and then go back to work the next day doing it the same way you’ve always done it. Posted in Miscellany | Comments Off on You Want Good, Improvisational Agile Training? You click the Videos link at the top and then you can click the GO link beside the Search Videos edit box. One more video. Click Next. These results don’t show what I’m looking for, so I’ll go Back. Notice that the results are in a different order. Not only on this page, but the result which had been number 10 on the second page now displays on the first page. 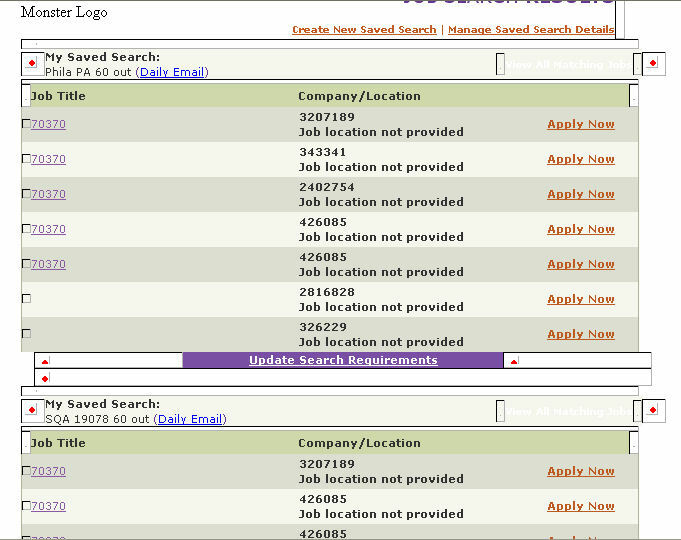 This is really, really crazy when you have 10 pages of results, such as the search for “Abby Teaches Zoe Not To Mark Defects As Closed When Zoe Wants To Improve Defect Counts For Client Milestone Meetings.” In this case, if you go backwards, you will see a completely different set of results as though it had conducted a completely new search. You know, result pagination and not re-sorting results without user input are pretty basic functions. Unfortunately, so many times organizations and development staffs take basic things for granted and don’t test them. After all, they’re only re-implementing the wheel, not re-inventing it. So they don’t bother checking to see if they inflated the tire, or as you call it in the UK, the boot bonnet tyre. I’ve Heard of Hidden Fields, But Hidden Questions? 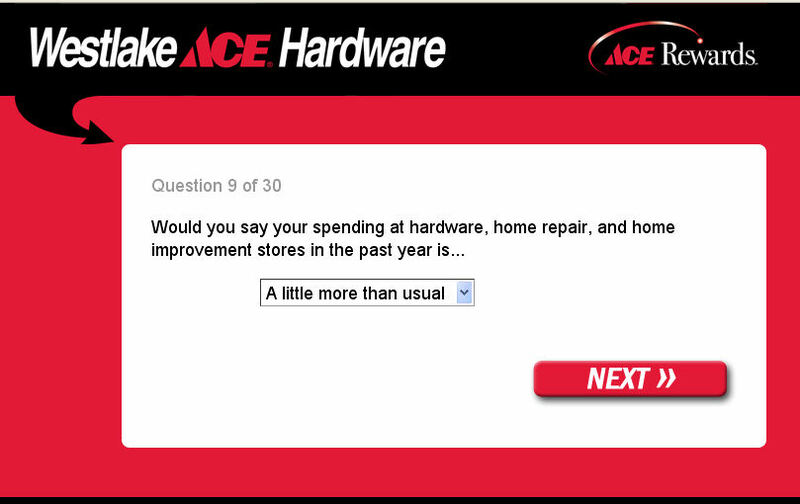 Small problem with this Westlake Ace Hardware survey. Whoa, Rufus. 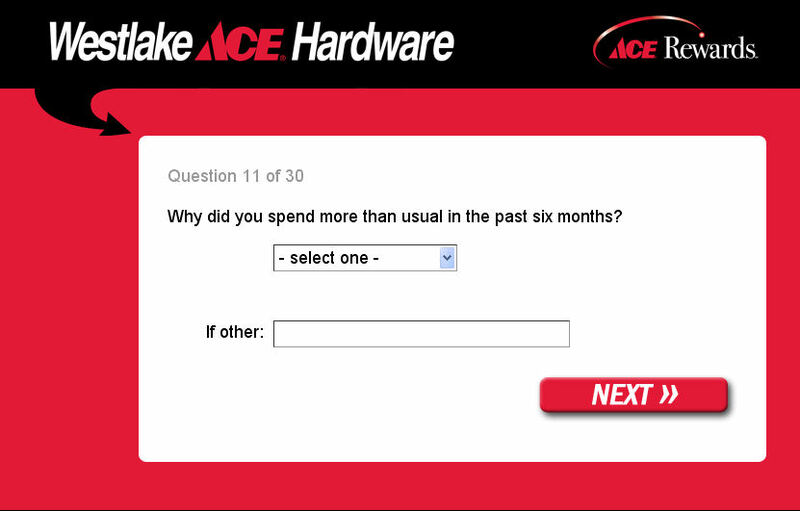 Not only did I travel into the future, but now I am being asked not about my purchases in the last year, but about why I spent more in the last six months. But I didn’t; I spent more in the first six months of the last year, and about the same in the final six months, that is the last six months of the year. This is a logical rift that can only be solved by attending a project kickoff meeting, where we will not plan on spending more than average on the first half of the project, but that first half’s effort will take up eighty percent of the allotted time for the project, leaving us 20% at the end for development and telling the name of the project to testing (Good name? QA approved the project!). Special bonus ding; apparently, I will be rewarded for a coupon for use on President’s Day. Say, specifically, which single President do we celebrate on that day? 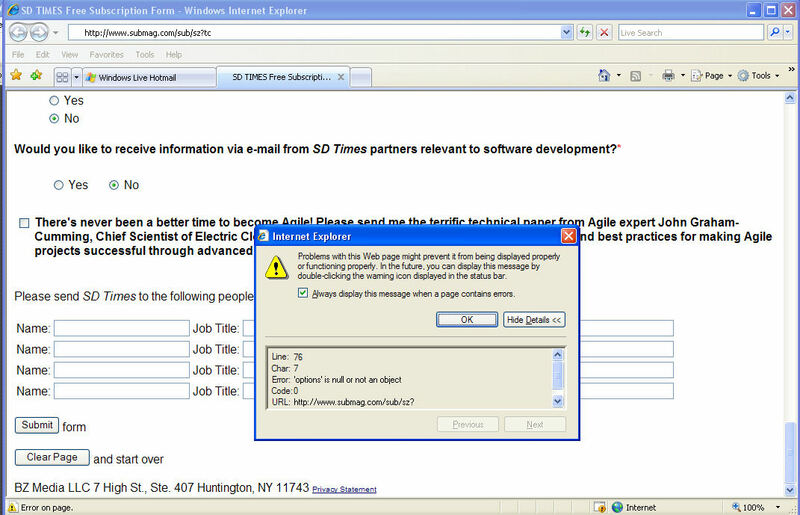 Posted in Failed Web sites | Comments Off on I’ve Heard of Hidden Fields, But Hidden Questions? That will give you the opportunity to use that bad Darrell-Hammond-as-Sean-Connery Scottish accent upon which you unfairly pride yourself. What Is The Unhappy Path, Alex? If you’re like me, you think you’re smarter than you are. If you’re really, really like me, you’ve taken the Jeopardy! online contestant search, a scheduled, timed little application that allows you to perform the equivalent of the old written test. If you’re not like me, though, you followed the unhappy path and could have missed out on the test. Posted in Failed Web sites | Comments Off on What Is The Unhappy Path, Alex? 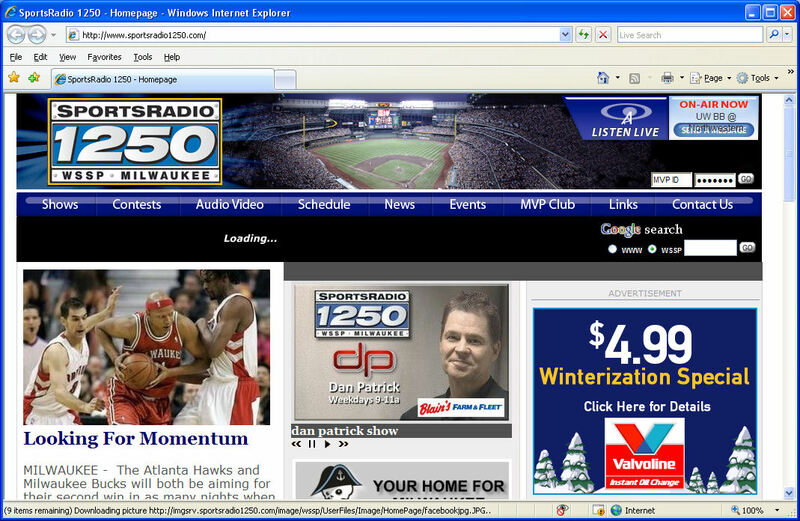 The Listen Live portion of WSSP’s Web site apparently can only handle ten or fourteen characters of dynamic text gracefully. Seems to me someone should have questioned that requirement a little earlier. You are currently browsing the QA Hates You weblog archives for February, 2009.